1 – Use salt and pepper to season pork. Add port in a large skillet and brown all sides on high heat for about 5 minutes. Then, remove from heat and let cool. 2 – Make a cut about 1-inch deep in the meat with a sharp knife, and insert the garlic slivers. You can do this all over. Once again, season the entire pork with sazon, cumin, oregano, adobo and garlic powder. 3 – In the crockpot, add chipotle, pour chicken broth, peppers, and mix. Add bay leaves before placing pork in the Instant Pot. Cook covered in a the pressure cooker by setting on high pressure with the meat button for 50 minutes. 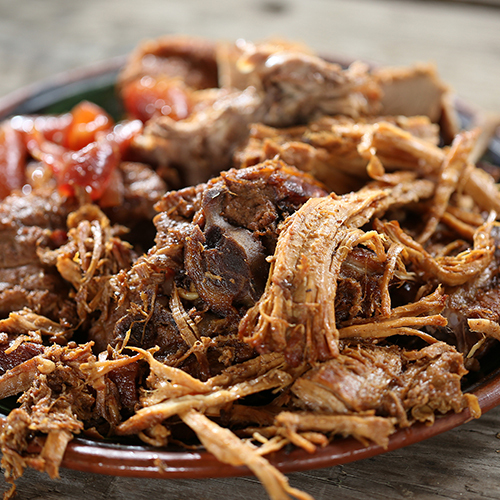 When the pressure is released, shred pork with two forks and combine well with the remaining juices at the bottom. Adjust cumin, after removing bay leaves. Add adobo and mix well.